Mardi Gras Bride mask is from Gypsy Renaissance's Wedding Masks collection. 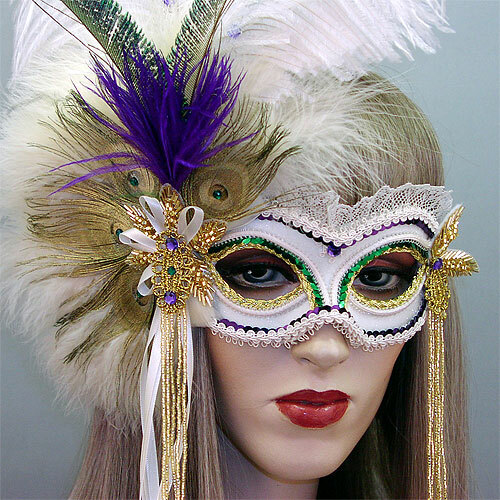 Mardi Gras Bride is a white masquerade mask with purple, gold, and green adornments. Mardi Gras Bride mask is covered with white satin fabric and decorated with metallic gold and white braiding, purple and green sequin trim, and white lace. Mask is adorned with a semi-circle of white marabou feathers, two white ostrich plumes, metallic gold painted peacock eyes, two peacock swords, and purple ostrich feather accent. Mask is embellished with white satin ribbons, gold glass beaded fringe, and gold glass beaded leaves. Finished with amethyst and emerald rhinestones.